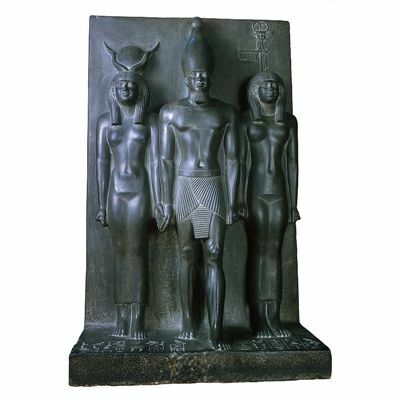 This sculpted triad, a three-person statue, shows King Menkaure between two ladies. The goddess Hathor is on his right and the personification of Cynopolis, the 17th nome of Upper Egypt, is on his left. He wears the crown of Upper Egypt and has a false beard. He wears the short pleated Shendyt kilt and holds two small cylindrical objects. The two ladies wear tight fitting dresses and have three-part wigs. They each hold in one hand the Shen sign of power and embrace the king with the other hand. Hathor wears her usual crown, composed of the sun disk between the two cow horns, while the other lady is placed beneath a jackal, the symbol of her nome. The text engraved on the base identifies them and records the different offerings given to the king from the nome.